A lot of us hear these terms per diem whereas, how many of us have truly grasped the essence of assets and liabilities? Read on to find out more about these terms with stimulating examples that form an integral part of the current market scenarios. Assets are something your company owns that can provide you with future economic benefits. Assets add value to your company and increase your company’s equity. The more your assets outweigh liabilities, the stronger is the financial health of the company. More assets mean, the company has resources to fulfill its obligations. For example, when Facebook was initially founded, very few people had smart phones. Until recently, Facebook was primarily known for its website and only a few people used the app launched later on. This all changed when in 2012, Facebook paid $1 billion dollars to acquire Instagram and later on in 2014, $19 billion dollars for WhatsApp. Although this mounted to a huge amount of money for the company, as of now it gives the company large profits along with letting the company stay on the edge of technology. These would be considered as assets for the company. 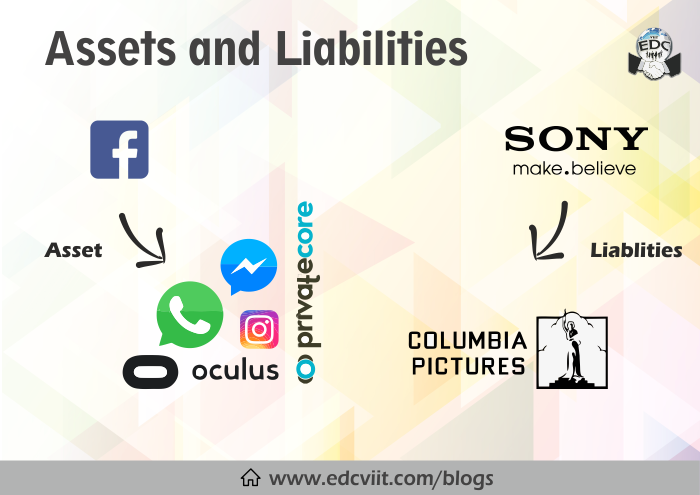 Company’s future obligations are called liabilities. This includes money that must be paid or services that must be performed. Liabilities decrease your company’s value as well as equity. A company whose liabilities exceed its assets is most probably in a financial crisis. For example, Kingfisher had accumulated dues worth $2551 million in 2012. The airline was operating on a cash and carry basis for the last six months with daily payments amounting to ₹8 million. This comes under liabilities which could bring the company under immense trouble financially. The aggregate difference between assets and liabilities is equity, which is the net residual ownership of owners in a business.